Not to be confused with Lake Muskoka. "Willow Beach, Ontario" redirects here. For the community in York Region, see Georgina, Ontario. 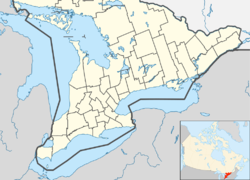 The Township of Muskoka Lakes is an area municipality of the District Municipality of Muskoka, Ontario, Canada. It has a year-round population of 6,588. Muskoka is governed by an elected Town Council consisting of a Mayor, District Councillors and Councillors representing each of the town's three wards. In addition, three Regional Councillors each represent a ward each. The Mayor and Councillors sit on the Muskoka County Council. Steamboat Bay in Port Carling. Protected areas in Muskoka Lakes include Hardy Lake Provincial Park and Torrance Barrens Conservation Area. The Muskoka Lakes Township Public Libraries offer research, literature, and cultural resources to local residents. ^ "Certificate of Election Results". Township of Muskoka Lakes. Retrieved 2018-12-05. ^ "Muskoka Lakes census profile". 2011 Census of Population. Statistics Canada. Retrieved 2012-03-07. ^ a b c "2016 Canadian Census". Statistics Canada. 2016. Retrieved February 26, 2018. ^ "Certificate of Election Results". muskokalakes.civicweb.net. October 22, 2018. Retrieved December 5, 2018. ^ "2016 Community Profiles". 2016 Canadian Census. Statistics Canada. February 21, 2017. Retrieved 2019-02-26. ^ "2011 Community Profiles". 2011 Canadian Census. Statistics Canada. July 5, 2013. Retrieved 2012-03-07. ^ "2006 Community Profiles". 2006 Canadian Census. Statistics Canada. March 30, 2011. Retrieved 2012-03-07. Tatley, Richard. Steamboating in Muskoka. Bracebridge, Ontario : Muskoka Litho, 1972. 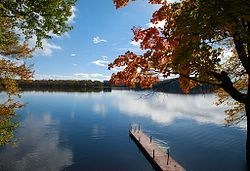 Wikimedia Commons has media related to Muskoka Lakes, Ontario.